It’s your biggest nightmare. The dream eco-holiday, your baby’s first steps. Your father’s last moments. Then somehow your pictures vanish. Taking pictures for every memory we make, every occasion we attend and with every person we meet is a gesture of remembrance. You can never neglect the fact that photographs taken help you remind the exact event, even after years of happening. Showing negligence in their safekeeping can be harmful. Accidentally or intentionally if you delete your picture and you want to get those back, the question arises, how to get the deleted photos back? Repenting over the loss is not an option. Dependable picture recovery software can be used in such a case. Nowadays computers have become a principle way of managing and handling information in many businesses. Data loss can be disastrous and stressful in cases where data regarding all the transactions stored at one place gets wiped off. Advantages of photo retriever are many for businesses where profits are based on data record maintained. Data recovery can retrieve and restore images and files etc., which are precious and important to them. These are quick and could recover data and photos in no time. Quickly and efficiently picture recovery app can retrieve data in a matter of a few minutes. There is no issue of images or information getting lost in any event of device problem. Taking the help of an efficient picture recovery app is always a better option. Avoid any taking risks and hazardous steps that could worsen the situation and render the data irreversible. Taking frequent backups of your information is always a better option. In spite of taking too much care of your data, you never know when it is about to vanish. Installation of dependable image recovery software is a blessing for your lost data. You can sit back and relax while your data recovery software takes the responsibility to handle your stress and provide you with maximum assistance and assurance. Not only extracting photos and media but also it scans the entire system and you can easily go through the photos and select the desired pictures you want to reload. Undoubtedly, picture recovery app is user-friendly and convenient to handle. Be it your memory card, digital camera, android phone, computer or even a Mac, these platform independent software provides you 100% assistance with all kind of devices so that you can easily get back your valuable data in no time. How to Retrieve Deleted Photos? Trusting on any software available in the market for data recovery is never an option. You need to choose the best one available. 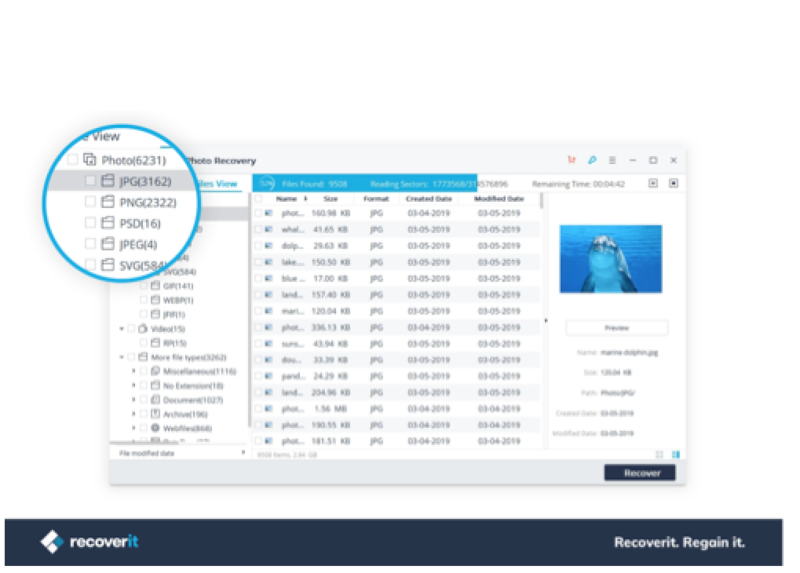 Recoverit photo recovery software helps you to detect whether or not your device is rooted before scanning. It is always advisable to root your device before restoring deleted images in large amount. 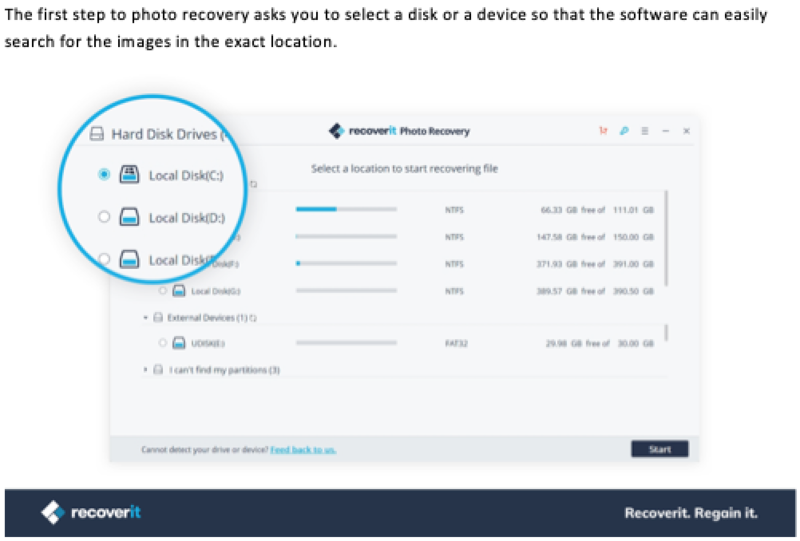 The first step to photo recovery asks you to select a disk or a device so that the software can easily search for the images in the exact location. This step presents the scanned results for the users and allows them to select the images they want to restore. In this step, the final recovery of the images takes place. The user needs to specify a location for restoring the images and then click on ‘recover’. Photo recovery free software allows you to first have a preview of the deleted photos, before actually finalizing the restoring process. This will enable you to select the desired photos you want to restore and neglect the useless one. 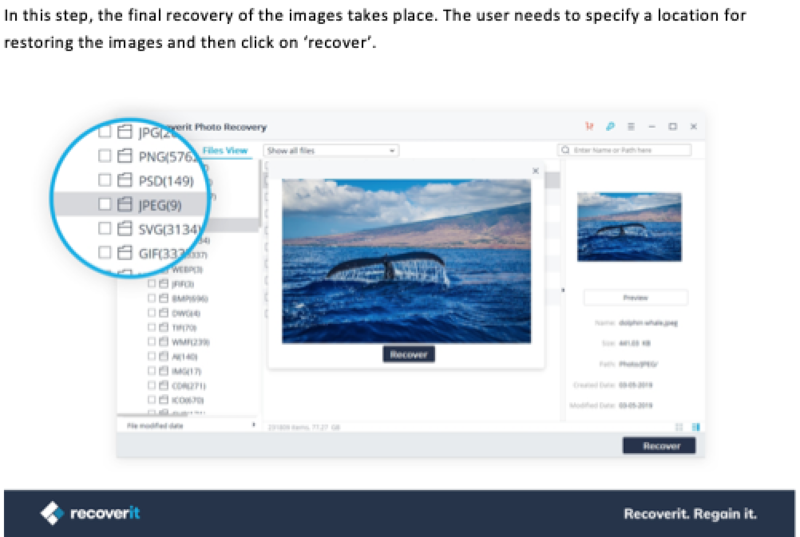 With the advancement of digital media, these photo recovery apps are blessings, your lost data will no more remain lost forever with Recoverit photo recovery software. If how to recover deleted photos is your question, then Recoverit photo recovery software is the only reliable answer. Enjoy the pleasure of experience good old days by retrieving deleted photos through this transparent app. Your information is as valuable for us as for you. This blog covers the entire information about the advantages of photo recovery app.